Be the first to share your favorite memory, photo or story of Woodrow (Woody). This memorial page is dedicated for family, friends and future generations to celebrate the life of their loved one. 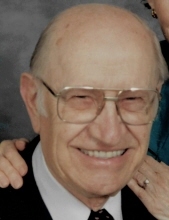 Frankfort – Woodrow W. Hoffman (Woody), 93, passed away on Thursday, November 23, 2018. Woody was the 3rd of 4 boys and was raised in Boyertown, PA during the Great Depression. Woody carried newspapers to earn money. He also helped his father in his shoe shop. Woody graduated high school at the age of 17 and went to work in a clothing factory until he was 18 and was drafted into the army to serve in WWII. Woody served under General Patton in the 35th Infantry (Kansas) Division during the Battle of the Bulge. At one point, he received a shrapnel wound and his lieutenant was going to put him in for a Purple Heart. However, before the lieutenant could turn in the paperwork, he was killed in action. After the war, Woody went to the University of New Mexico and earned a Civil Engineering degree. While in college he worked on surveying projects in the Western U.S. After college, he worked as a civil engineer for the Federal Highway Administration in Columbus, Ohio where he met and married Lois. They had their first son Greg there and moved to Chicago where they had a second son, Glenn. Woody continued to work for the Federal Highway Administration. They then moved to Frankfort, Kentucky and raised their two sons and eventually retired. The family attended First United Methodist Church in Frankfort. Woody was active with his wife and sons. He was active in square dancing with his wife and danced with his co-workers and their spouses. He played ball with his sons, and was a general all around handyman. He had engineering skills and engaged in light auto repair, plumbing, electrical work, and small appliance repair. In retirement, he did some gardening, continued to square dance and began round dancing with his wife and traveled throughout the US and Canada. Woody attended some reunions with his WWII unit and traveled back to Europe to visit the people and the land he helped to free from the grips of Germany during WWII. Woody never received his purple heart as the war records were destroyed in a fire some years later. Woody was happily married to his wife Lois for over 58 years. They were married on September 7, 1957. Woody’s son Greg is a Manager/Chemical engineer in Oak Ridge, Tennessee. His son Glenn had been a computer programmer and is now retired from Kentucky State Government. Funeral service will be held at 1:00pm on Friday, November 30, 2018 at Clark Legacy Center, Versailles Rd. Dr. Phil Hill will be officiating. Entombment will follow at Sunset Memorial Gardens. Visitation will be held on Friday, November 30, 2018 from 12:00pm until the time of service. In lieu of flowers, memorial contributions may be made to Kairos Prison Ministries and AXYS in Colorado. Online condolences may be expressed at www.clarklegacycenter.com. To send flowers or a remembrance gift to the family of Woodrow (Woody) W. Hoffman, please visit our Tribute Store. "Email Address" would like to share the life celebration of Woodrow (Woody) W. Hoffman. Click on the "link" to go to share a favorite memory or leave a condolence message for the family.